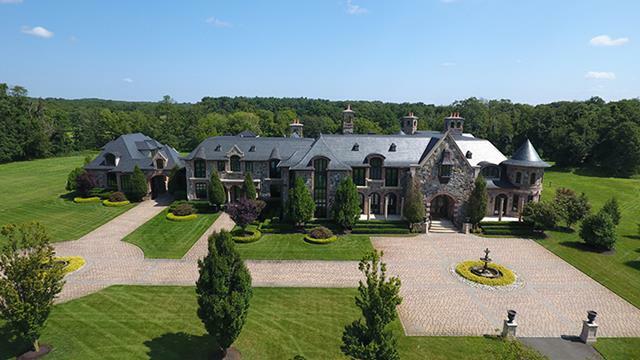 Abbey Farm is a 23.09+/- acre estate with over 18,000 square-feet styled like a European Chateau. The estate is gated and boasts multiple ponds and fountains along the winding driveway to the main entrance of the home. The property was created for living and entertaining on a grand scale, yet it is welcoming, warm and comfortable for everyday living. Guests are welcomed through a magnificent entrance hall that leads to a breathtaking grande staircase that is the centerpiece of the home. An entertainer's dream-come-true, the home includes a palatial grand room that can easily accommodate over 150 guests. Eight fireplaces, elaborate crown moldings, French doors, a wall of windows, 2 custom furniture quality kitchens, courtyard and separate guest cottage are just some of the features in this 6 bedroom 10 bath home.